In 1924, just a few years before she had to leave her beloved Mexico in disguise as a refugee from religious persecution, Mother Luisita, the foundress of the Carmelite Sisters of the Most Sacred Heart of Los Angeles, prepared a young girl for her First Holy Communion. The love and reverence for Jesus, present in the Holy Eucharist, was so evident in Mother Luisita that a spark was ignited in the heart of little Andrea, named after the apostle Saint Andrew because she was born on his feast day. 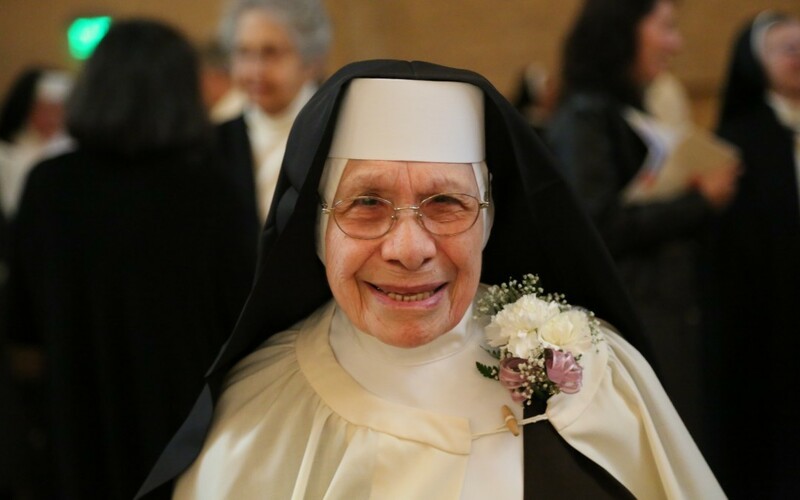 As she became aware of how much God loved her, this little girl was not only filled with a deep love of Jesus, but she began to desire in her heart to serve Him as a consecrated religious like her mentor, Mother Luisita. This January, that little girl- now known as Sister Patrocinio of Our Lady of Mount Carmel- celebrated eighty years as a Carmelite Sister. During her lifetime of ninety-five years, she witnessed the religious persecution in Mexico and witnessed the holy death of Mother Luisita, now a candidate for sainthood. 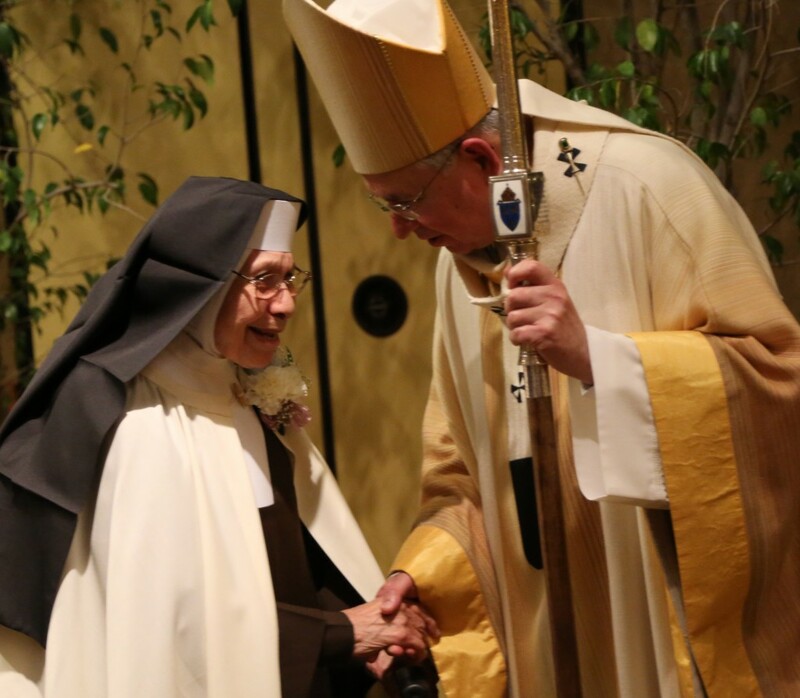 She has lived eighty of her ninety-five years as a Carmelite Sister. Whenever she is asked to speak of her life as a Carmelite Sister, a big smile forms on her face and it soon becomes apparent that her smile reflects the radiance of her soul united to her Bridegroom, Jesus. At age 95, the apostolic zeal of Sister Patrocinio, planted in her heart in 1924, still burns brightly. “I was born and raised in Los Altos, Jalisco, Mexico, where I first met the Carmelite Sisters of the Sacred Heart. At the age of five when I made my First Holy Communion, I asked God to make me a Sister because I liked them and wanted to become one of them. This desire became so strong that at the age of seven, I went to see Mother Luisita, the foundress of our Congregation and told her that I wanted to enter the convent. She was very kind to me, but explained that I would have to wait until I was at least fifteen. I returned home very disappointed, and each birthday I counted off another year until I finally reached fourteen. Then I asked permission of my parents to begin making arrangements to join the Sisters. They were most understanding and helpful, although my dear mother found it hard to accept my leaving home. She often cried which made it more difficult for me to go through with it. Also, I was the oldest of eight children. Because of the religious persecution going on in Mexico, my parents were concerned about the dangers involved with entering the convent. Although at the time the persecution was less that it had been, it was still unlawful to be a priest or religious. The Church in Mexico had to follow an underground way of life. As a result of the religious persecution, most of my training period in the convent was spent hiding and moving from place to place. Despite the hardships, poverty and continuous danger involved in our way of life, I experienced great peace of soul and a deep interior joy. It was like Christ telling us again about the foxes having dens while He did not have any place to lay His head. It was also exciting to think that we shared some of what the Christians suffered for their faith in Christ. But this excitement had its anxieties too. One day the authorities found out that four of us were hiding in a particular house. While they were trying to break in, we quickly consumed the Sacred Hosts which were kept in our makeshift chapel located in one room of the house. One of the Sisters succeeded in escaping over the roof, the other two sisters were arrested and I was left behind only because I had crawled into bed and pretended to be very sick with a contagious disease. It wasn’t completely untrue since after that incident my health began to fail.